It's no surprise that Russian literature has frequently reflected themes of misery, suffering, sadness and torment because Russia, and its Soviet Union incarnation, has been racked by turmoil for generation after generation. Despite Czarist misrule, the Napoleonic War, the Crimean War, two World Wars, the Bolshevik Revolution, the brutal Civil War, the Stalinist repression and the poverty, Russia has produced some of the greatest writers to ever put pen to paper. Many of them suffered like the characters in their works. Their understanding of pain and suffering goes way beyond the physical and many books show how families, lovers and entire cultures can fall apart when pressure is applied by external forces. Everyone needs to experience Russian literature at some time. Can you call yourself well read without having completed books by Leo Tolstoy, Fyodor Dostoevsky, Nikolai Gogol, Boris Pasternak and Alexander Solzhenitsyn? From Ivan Denisovich and Doctor Zhivago to Anna Karenina and Ivan Ilyich, journey through murder and betrayal, illness and mental anguish, Siberian labor camps and cities under siege. And each one of them is a remarkable book. A brilliant novel, perhaps one of the best ever, but very depressing. The adulterous affair between Anna, wife of Aleksey Karenin, and Count Vronsky, a young bachelor, leads to tragedy on the tracks. A lesson in restrictive moral codes. Where do we begin? 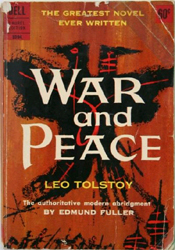 Tolstoy conducted extensive research on the Napoleonic Wars and charts a period of huge turmoil. Five families undergo horror after horror - battle wounds, death in childbirth, illness, betrayal etc. An 1866 novel that questions the morals around killing and examines mental anguish. Impoverished Rodion Romanovich Raskolnikov believes it is fine to murder a pawnbroker because the money lender is evil. First published in 1859, On the Eve is an end-of-era tale describing the fading Russian nobility. Elena, a passionate young woman, abandons her family, home and country to follow a revolutionary to his native Bulgaria. The book signals the upheaval to come. A graphic description of life in a Stalin-era labor camp in Siberia. Simple but relentless. One of the best books of the 20th century that stunned the literary world when it was published in 1962. A picture of dehumanization. Poet and doctor Yuri Zhivago is torn between two women during the Russian Revolution of 1917 and the brutal civil war that follows. First published in 1957, the sensitive doctor is rarely in control of his own destiny. This novel describes 10 tragic years in Cossack life in Russia’s Don region. It stretches across World War I, the Revolution and the Civil War, and questions the ruthless practices of the Communists used to repress the Cossacks. Depressing Russian literature isn’t always about war, politics and romance gone wrong, in this book Dostoevsky details how gambling can ruin your life. An intense portrayal of addiction although there is a messy love affair thrown in for good measure. The key character, Oblomov, a young nobleman, stays in his bed for the first segment of the book. Oblomov is incapable of taking decisions of any significance and this is satire on the uselessness of the 19th century Russian nobility. Not truly depressing but Cossack leader Bulba shoots his son Andriy for joining the Poles and then sees his second one, Ostap, executed by the Polish. Bulba’s end is not pretty. Hemingway called it one of the best novels of all time. Adultery, a bored wife who turns to a marriage into murder, another murder (this time of a child), childbirth in prison, sexual favors and a very nasty ending. There’s a little Shakespeare and a bit of Madame Bovary here. Tolstoy, who was an officer in the Russian army, brought home the horrors of the Crimean War to the general public of Russia with this book about the famous siege and how it affected the ordinary soldiers. Tolstoy does death probably better than anyone else. Ivan Ilyich, a successful man, is faced with his own mortality in his last agonizing moments where he has to confront his own mistakes. A novel about life, death and why we have to suffer. This one is very gloomy but without the dramatic battles and mayhem found in other Russian novels. This is a grim study of a spiritually bankrupt country split by greed and selfishness. A very bitter portrayal of Russia. Bunin's book, set in the Russian Revolution, is a bleak portrayal of rural life - full of stupidity, brutality and violence. Many characters are portrayed as almost sub-human. Bunin became one of many writers living in exile. This is a collection of brutal short stories about labor camp life in the Soviet Union. Shalamov spent many years in horrific conditions in mining camps and wrote from experience. One of the great short story collections of the 20th century. A gloomy semi-satirical novel about a group of workers in the early days of the Soviet Union trying to dig a huge foundation pit for a giant house. The workers dig but fail to understand the meaning of their work. Grim existentialism. Praised as the new Doctor Zhivago, this epic historical novel published in 1994 tells the story of the Gradov family struggling for survival under the Josef Stalin regime. Accused of political subversion, Dostoyevsky was sentenced to four years in a Siberian prison camp. Years later, he wrote this semi-autobiographical memoir of a man imprisoned for murdering his wife. Based in a besieged Stalingrad, the most brutal of Russia’s World War II battles, a family is scattered across Europe amid almost unimaginable horrors. This is an epic novel that also offers hope along with the pain.